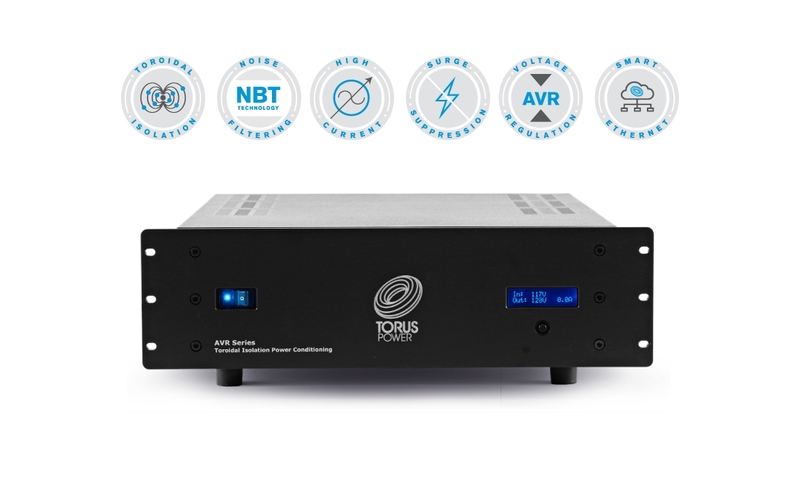 Here’s how: Torus power isolation units present low impedance to any electronic device that is connected to them. A Single 20 amp Torus Power transformer has an output impedance of 0.2 ohms and can deliver 400 amp peaks (instantaneous current). A typical 200-watt audio power amplifier demands 10 amps RMS current from a 120-volt line (1200VA) but may demand up to 50 amp instantaneous peaks. The standard residential wall receptacle can’t supply the 50 amp peaks because it typically has higher nominal impedance. A Torus 20 amp isolation transformer plugged into the same wall plug can supply these peak current requirements quite easily. Here’s how. Torus power uses series mode surge suppression technology to fully protect your equipment from damaging lightning strikes and power surges. Torus Power’s Series Mode Surge Suppression does not shunt the voltage spike to ground like MOV’s do, and therefore the ground remains stable and uncontaminated. Torus Power’s surge suppression has clamping voltage onset that absorbs voltage surges more than 2V above peak nominal line voltage. Torus units are built to surpass IEEE endurance standards of withstand lighting strikes of 6000 volts, 3000 amps with 1000 repeats. Here’s how: Torus power provides isolation from the outside power grid through a Plitron designed and built toroidal isolation transformer. Torus Power isolation transformers eliminate electrical noise caused by sources such as motors, lights, appliances and dimmers commonly found in the home environment. Providing power to your system from a Torus Power isolation transformer is infinitely superior to using wall power that is increasingly polluted and noisy. Here’s how: Torus Power builds many models with power ratings beyond 20 Amp, the power rating where most other manufacturers stop. At Torus Power we build models with power ratings of 90 Amps, 100 Amps, and beyond. Using a single, larger isolation transformer to power a system will provide a superior ground connection, lower the noise floor of the entire system, and effectively reducing the possibility of ground loops. eliminates audible noise in the power transformer regardless of line conditions, DC offset and overvoltage. professional recording and broadcast studios, as well as in home media and audio/video systems. improvements that are immediately noticeable in audio and video systems! Click hier voor de Torus Power brochure.